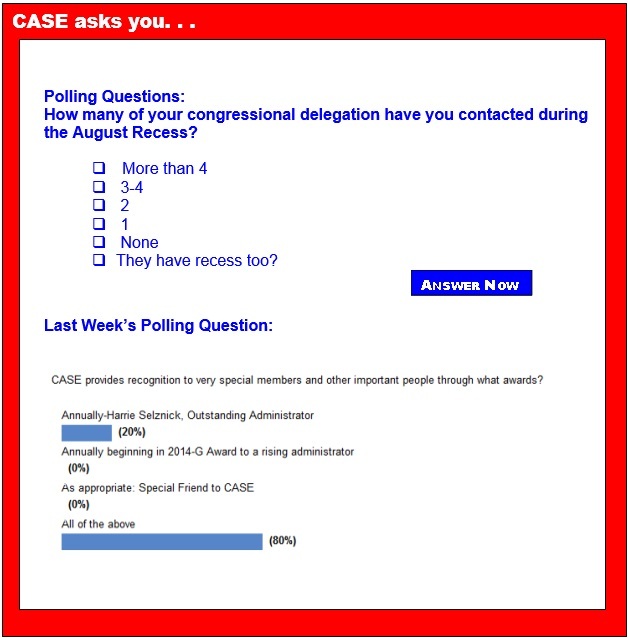 CASE has amazing committees. The backbone of CASE is our volunteer base. A big part of that base is our committee structure. All of our committees are important and have creative, hardworking, competent members. Maybe you would like to be considered to serve on one of our committees. Click here for a committee volunteer form to complete and send back to me. We always have a list so our chairs can look at it when they have a vacancy. Our Research Committee, chaired by Dr. Barbara Pazey (TX) has already been working hard and want to know more from you our members what types of research you would like to see them work on for the next two years. In one of my favorite TED Videos, Heidi Jacob Hayes, says research means "to look again!" What are some of the topics or issues you think our Research committee needs to look at again! Click here to take a quick survey to give them your ideas on what direction they need to be pursuing! Speaking of you ... We need as many CASE members as possible to join us in San Antonio for our 25th annual fall conference! Our early bird registration will be up this week at www.casecec.org but it will be for a very limited time so register now for these great savings! Right now, your members of Congress are at home on recess meeting with their constituents. As CEC advocates, the time to take action is now! Your mission is simple: schedule meetings with your elected officials at their district office before Congress reconvenes September 8th. With Congress expected to take action on education funding, now is the time to meet with your Congressional delegation! 4 Step Action Plan to guide you and provide additional resources. Read the CEC Congressional Recess Packet here. As summer winds to a close, the long days of playing, running, swimming and biking cease and are replaced by hours of sitting at a desk, eyes ahead. For some children this is problematic, and attention deficit hyperactivity disorder is common among children of school age. The causes of ADHD are not known, but studies looking into how genetics, environment, social surroundings, nutrition and brain injury contribute to the process. Another line of research is the relationship of physical activity to the symptoms of ADHD. The number of children with disabilities is on the rise, largely due to growth in incidence of mental and developmental disorders, researchers say. A new analysis in the journal Pediatrics finds that between 2001 and 2011, there was a 16 percent increase in the number of kids with disabilities. Though children living in poverty remain more likely to have disabilities, the study found that the greatest increase in diagnoses was seen among children from wealthier families. For the study, researchers looked at data on nearly 200,000 kids from the National Health Interview Survey — a routine government poll of parents with children up to age 17 — collected between 2001 and 2011. Do you have a student in your school or classroom that struggles to connect with his peers? Is your own child frequently on the receiving end of cruelty at the hands of classmates or "friends?" We know that young people who lack social support are particularly vulnerable to being bullied. What can we do then, as professionals and as parents, to teach our kids the skills they need to make positive friendships and maintain nurturing peer relationships? As children learn basic arithmetic, they gradually switch from solving problems by counting on their fingers to pulling facts from memory. The shift comes more easily for some kids than for others, but no one knows why. Now, new brain-imaging research gives the first evidence drawn from a longitudinal study to explain how the brain reorganizes itself as children learn math facts. The Obama administration first offered No Child Left Behind Act waivers to states back in 2011. Since then, there have been numerous changes and variations to the coveted flexibility. This interactive timeline tracks those twists and turns. On the last day of school in June, principal Aurelia Curtis was harried. An auditorium full of teachers was waiting for her. But instead of congratulating them on a good year and sending off three retiring staff members, she was in her office signing the last of the 742 teacher evaluation forms for her staff of nearly 150 that she had to finish by an end-of-year deadline. Curtis, a stern but beloved leader who shares her name with Curtis High School here in Staten Island, New York, where she began her career 30 years ago, spends more time these days filling out intensive teacher evaluations required by the state than she does talking to her teachers. Or that's how it often feels. When the PBDE fire retardant phase-out began ten years ago, we hoped that manufacturers would replace them with safer alternatives. That didn't happen. Tests published earlier this month by myself and other scientists at the Environmental Working Group and Duke University detected a biomarker indicating that all 26 children in our study had been exposed to a fire retardant called TDCIPP, linked to cancer and endocrine disruption. Their level of exposure was nearly five times the average level found in their mothers. In the most extreme case, a child had 23 times the level of the mother. Today's education reformers believe that schools are broken and that business can supply the remedy. Some place their faith in the idea of competition. Others embrace disruptive innovation, mainly through online learning. Both camps share the belief that the solution resides in the impersonal, whether it's the invisible hand of the market or the transformative power of technology. Neither strategy has lived up to its hype, and with good reason. It's impossible to improve education by doing an end run around inherently complicated and messy human relationships. When Alberto Cortes was held back in fourth grade because of low math skills, he thought his world had come to an end. "The first day of going back to fourth grade, I see all my friends with new teachers there in fifth grade," Cortes said. "I started crying because I had to do fourth grade again and they got to go to middle school." At first the humiliation and embarrassment of retention motivated Cortes to try hard in his classes. But by seventh grade, he was smoking and doing graffiti to impress kids and shed his reputation as the "dumb" older kid. Learning to sing or play a musical instrument can improve language and reading skills of disadvantaged children, according to a new study released Friday. Nina Kraus, PhD, a neurobiologist at Northwestern University, found that musical training has an impact in strengthening neural functions as well as a connection with sound and reading of children in impoverished areas. Her previous research focused on the impact of music lessons on children of the middle or upper class. This study, which is being presented to the American Psychological Association, included hundreds of students in Los Angeles and Chicago public schools with about 50 percent dropout rates. It seems you can't go anywhere in the education world without hearing about game-based learning. At its core, game-based learning connects learning and meaning to content to give students an intrinsic learning experience, in which the games elevate the content in a meaningful and engaging way. Games are particularly effective learning tools because they give students open-ended environments in which to explore, play and create. The number of children with disabilities is on the rise, largely due to growth in incidence of mental and developmental disorders, researchers say.